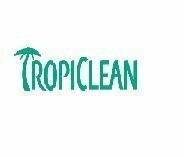 Our shampoos are made by Tropiclean: the ingredients are organic, and very gentle on coat and skin, with biodegradable packaging. A standard product for every dog we bath is the Tropiclean Facial Cleanser - a lot of other groomers charge extra for this, but we don't as we regard a very clean face as a necessity, and of course it smells lovely. We have products for dog's with normal skin as well as sensitive skins. We also have some products to deter parasites.